Continuing on with part 5 of our 8 part blog series dedicated to showing the differences between Autodesk Inventor Professional 2011 and SolidWorks Premium 2011 for digital prototyping workflows, we examine the ability to export MCAD models to BIM. Not just the models, but models that contain smart information needed by BIM systems. Besides the images we have videos below of how our engineers used each system to perform the test objectives. In this test, we started with a complex assembly that had already been designed in the mechanical system. The goal was to export a simplified version of the assembly for inclusion in Autodesk Revit software (BIM software). The software should allow the user to reduce the level of detail in the exported file to protect proprietary design information, to indicate to the BIM software the category (window, door, HVAC, etc.) of the exported data, to provide types and locations for plumbing and electrical connections, and to be able to control the orientation of the exported part or assembly. 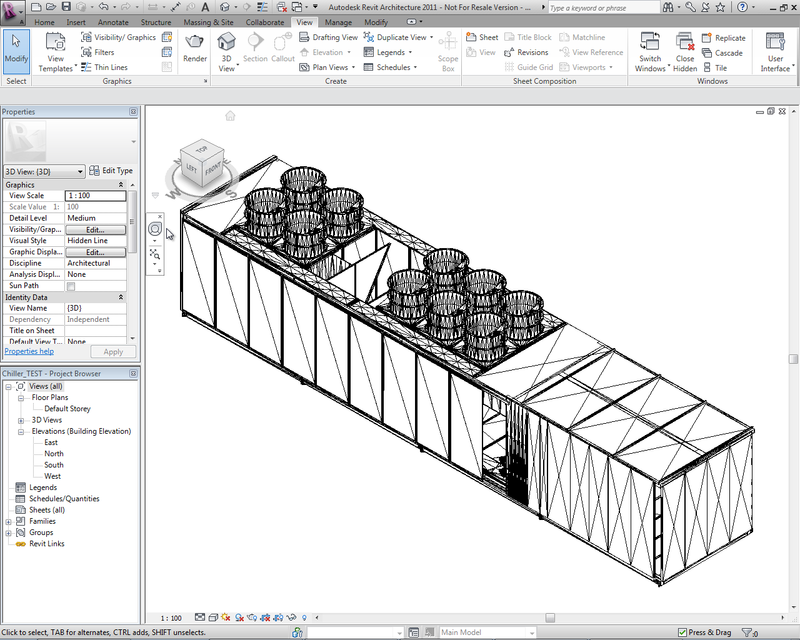 Autodesk provided a video of the chiller and the workflow performing the desired steps. 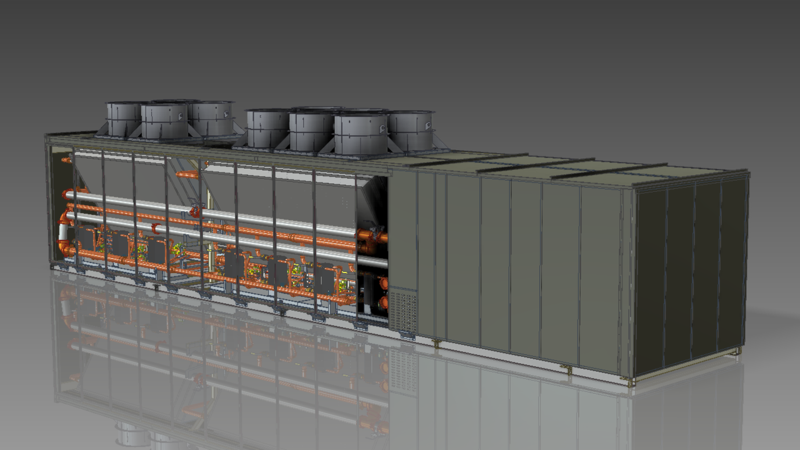 Also provided was an IGES file of the chiller with all the model details. Autodesk Inventor has a dedicated workflow that communicates a lightweight version of the geometry with critical information like connection points and component types while maintaining all physical and visual aspects of the design in a file format that can be easily handled by the most common BIM applications. SolidWorks does not have a dedicated workflow. SolidWorks 2011 added the ability to exchange simplified geometry data, but with limited amounts of component information due to the use of a neutral file format. It was not able to provide connection points or carry physical and visual properties over to the BIM system. The first step was to simplify the model by suppressing proprietary and unnecessary parts from the assembly and removing details such as small holes, grilles, etc. This eliminates exposing intellectual property and also reduces the level of detail, avoiding large file sizes. Inventor was able to suppress all unnecessary components easily. 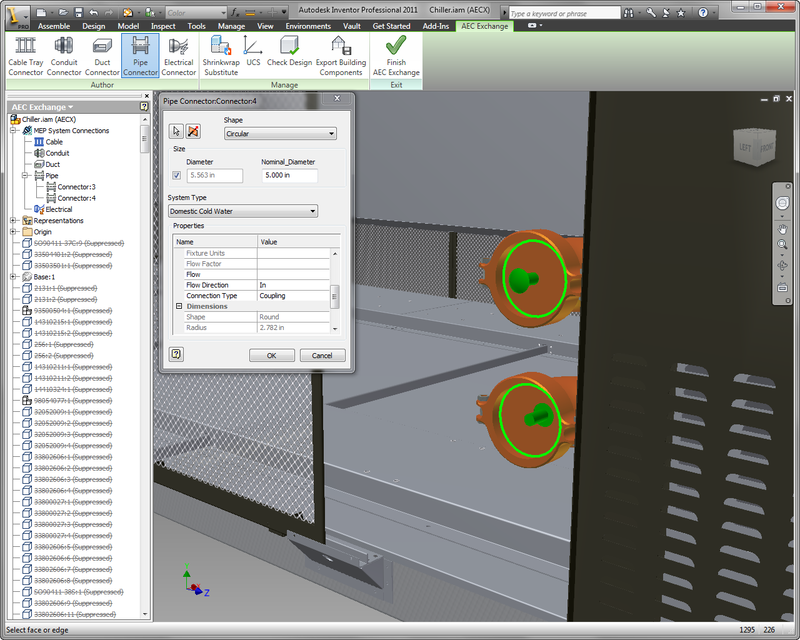 A shrinkwrap feature simplified the assembly with native and non-native data by removing small features and patching small holes, reducing the file size. SolidWorks was able to suppress unnecessary components without issue. Because this was imported data, SolidWorks was unable to further simplify the designs, although had it been native data it may have been possible. Readers should note that the Inventor data, however, was native and thus a somewhat unfair comparison. The second step was to orient the part properly for use in BIM software. Ensuring that models come in with the correct orientation removes the frustrating process of reorienting every time the product is inserted into a design. Inventor allows the user to create and assign a custom local coordinate system that can be specified on export thus eliminating this issue. SolidWorks can create a custom user coordinate system (UCS), but cannot use it when exporting IFC files (a BIM standard file format). A new assembly needs to be created with the product placed in the correct orientation. This workaround requires additional time to create the new assembly and creates additional data to manage. The third step was to define connection points to the assembly with sizing and connection attributes. Mechanical, electrical, and plumping (MEP) engineers need to know the location, size, and type of connections required for the product when designing piping or wiring for the building. Inventor allows the user to specify the location of connections along with information about pipe size, wiring, connection method, system type (i.e. hot water/cold water/120v/240v/etc. ), and flow direction. SolidWorks is unable to assign connection properties, instead requiring the data to be manually communicated, a minimally acceptable alternative. The final step was to export the assembly to a file format that can be read into BIM software with the necessary attributes assigned. Inventor exports file formats that can be directly read into Revit or AutoCAD and can be included in Building Information Models. Component types assigned in Inventor were carried over so no additional categorization was required. Additional properties are carried over, such as weight, size, and appearance. 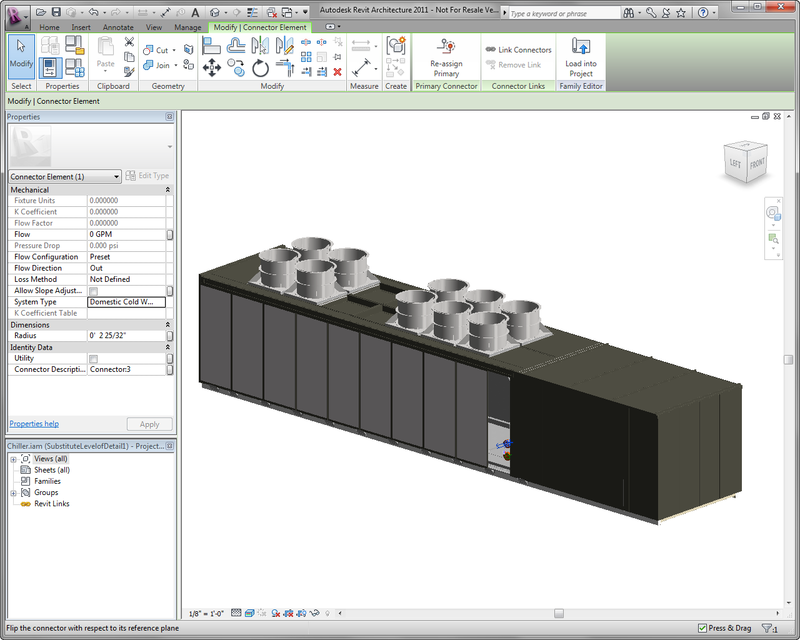 SolidWorks exports IFC 2×3 neutral format files that can also be directly read into Revit or AutoCAD. Component type can be assigned on export and are carried over into Revit. BIM designers are required to manually assign additional properties. The next blog in this series will examine interoperability and direct modeling of an imported model, focusing on importing a CATIA model, modifying it, and creating drawings. Stay tuned or sign up to be notified of my blog updates. To explore what had transpired, earlier today I spoke with Don Hemmelgarn, ITI TranscenData’s president. Apparently, Proficiency, with a capital investment in excess of $40 million was unable to gain enough market share or revenue to satisfy its investors, who refused to invest more in the company. Hemmelgarn expects Proficiency to add about 20% of ITI TranscenData’s expected revenue of $15 million in the next fiscal year, or about $3 million in revenue, a mere pittance in a $5 billion plus market. Hemmelgarn is excited about bringing the Proficiency technology into his company, thus adding feature based translation and a 450 man-year investment to their technology. ITI TranscenData specializes in working with large OEM’s with a continuing need for data exchange between unlike systems, counting among their clients the major automotive and aerospace companies. Most important for this clientele is the ability to automate translations and to verify that the translation was successful and accurate. ITI TranscenData software seems to do just that and the company seems to be on a steady upward path in terms of revenue, with year over year growth in the last five years, better than many CAD software companies can claim.